Out of concern for all busy bees who may be already involved in hectic preparations for the upcoming Easter season, we will lay out the rules of this breezy bargain in maximally simple and concise terms. Download our free widget to unlock a bouncy 15% discount embracing the entire spectrum of our software. Be mindful of the fact that the promo code extends only to the annual license of the products and must be taken advantage of before the end of 3rd April! Let us not forget that spring is also the time of surprises. That being said, here is one for you too! Every single person who makes a purchase on our Marketplace applying this spring-inspired promo code will automatically take part in additional prize draw. Once the promotion is over, we will give away extra $25 credits valid for 30 days to three lucky participants which are to be picked at random. Circle back to us on 4th April for the exciting results! And what do you love spring for? 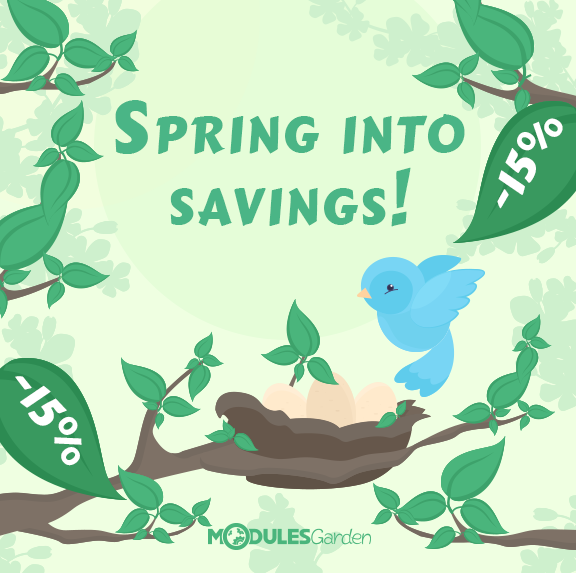 We are truly glad to see how many of you got into the spring mood this year and joined our bracing promotion! As promised, the lovely bonus – $25 credits goes to three, picked totally at random persons who made a purchase in our Product Marketplace. Expect to receive a message with further instructions concerning your gift any time now! Thank you all for your enthusiastic participation and stay tuned for a next promotional event!